Call your local WineStyles to RSVP, limited seating available! 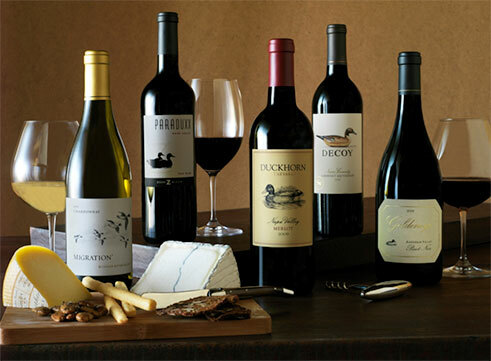 Please join us to taste amazing wines from Duckhorn Wine Company. Founded in 1976, Duckhorn Vineyards has been crafting classic Napa Valley wines for nearly 40 years. This winemaking tradition has grown to include 7 meticulously farmed Estate vineyards, located throughout the various micro-climates of the Napa Valley. Founded by Dan and Margaret Duckhorn in 1976, their family of wines include Duckhorn Vineyards, Paraduxx, Goldeneye, Migration and Decoy. With grapes selected from the finest estate vineyards, as well as a variety of sought-after vineyard sites, each winery is presented with a canvas of lots from which blend its wines. Focused on optimal grape selection, innovative winemaking techniques and a premium barrel-aging program, Duckhorn Wine Company is founded on an unwavering commitment to quality. Our national tasting event in October will sell out fast! Contact your local WineStyles for details and reservations! This entry was posted in Duckhorn Tasting Event and tagged duckhorn, local wine event, tasting, wine, wine tasting, winestyles. Bookmark the permalink.